I’ve been going through my old recipes from Cooking Light and stumbled upon this little number. 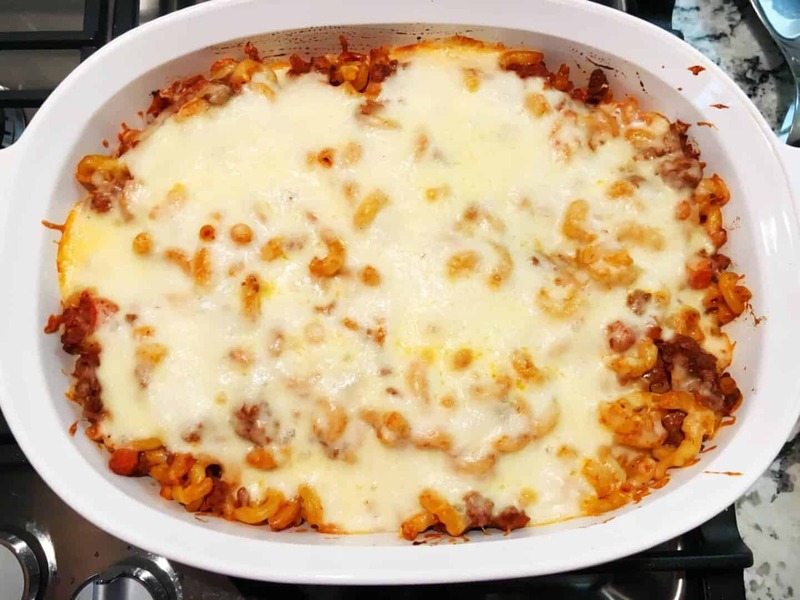 It’s perfect for a weeknight to feed a hungry family, and you can feel good about what’s in it. Yes, yes, there are carbs. But come on, every once in a while, you need a lil pasta fix. I don’t know about you, but I ate a lot of Hamburger Helper growing up (and Tuna Helper and Chicken Helper). They actually weren’t too bad, but I’m good never eating them again. This delicious dish reminds me of those good ole Hamburger Helper days, but no flavor packets needed. Just good ole stuff you’ve already got in the pantry. Plus, I don’t think HH ever made a quick béchamel, which you do in this recipe (flour, milk, nutmeg, cheese). 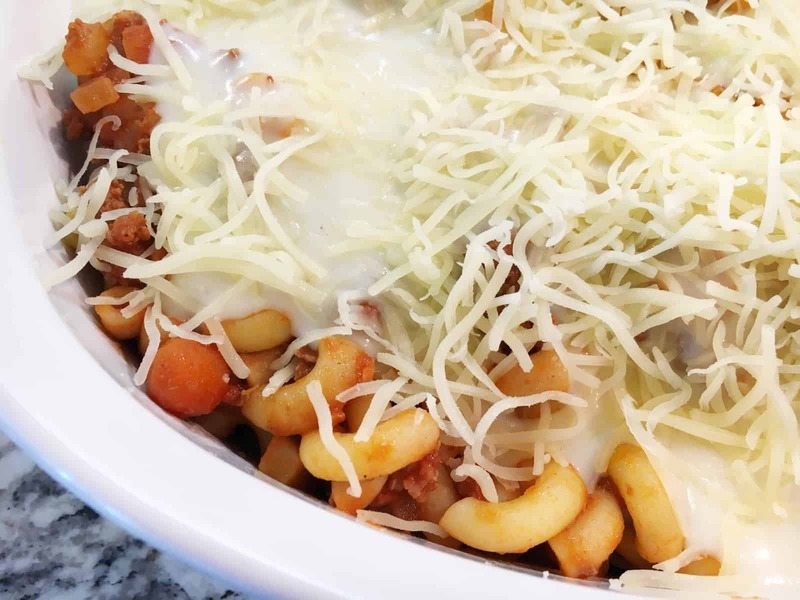 It adds a good creamy dose of yummy to the pasta and beef. It makes about 8 hearty servings, so we’ll be freezing the leftovers into 2-person portions in tupperware. Pasta usually keeps well in the freezer. Just thaw the night before you’re going to eat it to soften the noodles. Heat a pot of heavily salted water until boiling. Cook the pasta for 8-10 minutes until al dente. Drain and rinse with cold water to stop the cooking process. Heat the oil in a Dutch oven over medium-high heat. Add onion and carrot; sauté 5 minutes until the onion becomes translucent and carrots begin to soften. Add garlic; sauté 1 minute. Add beef; cook 5 minutes or until browned, stirring to crumble. Add tomato sauce and salt and pepper to taste. Stir thoroughly and cook 2 minutes until heated through. Add pasta to beef mixture in pan, stirring to combine. 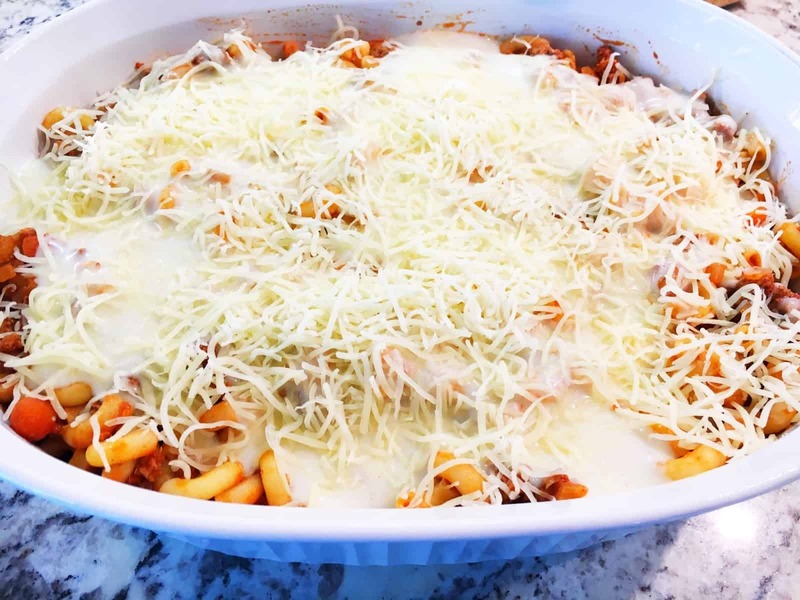 Spoon pasta mixture into a large baking dish coated with cooking spray. Place milk, flour, nutmeg, and 1/4 tsp. salt in a medium saucepan; stir with a whisk until blended. Cook over medium heat 3 minutes or until thickened, stirring constantly with a whisk to prevent burning. Add 1 cup cheese, stirring until smooth. Pour cheese mixture over pasta mixture; stir well. Top evenly with remaining ½ cup cheese. Bake at 350 for 20 minutes or until lightly browned.